The beginning of 2016 marked a historic drop in oil prices, hitting a 12-year low. The plummeting prices reflected the drastic change in oil trends, wherein the global supply of crude oil surpassed its demand. The downturn in oil prices resulted in a severe oil glut, creating a storage crunch. Considering that more crude oil was being stored rather than sold or refined, the demand for oil storage facilities has surged over the past few months. Fluctuating oil prices have led to the expansion in oil storage facilities and the overall market. An increasing number of companies are not only offering a host of value-added services but also including logistics services in addition to storage facilities. The several opportunities that players have in the global oil storage market are likely to drive the market volume from 1,337 million cubic meter in 2014 to 2,027 million cubic meter by 2024 at a 4.73% CAGR therein. Geographically, the global oil storage market comprises North America, Asia Pacific, Europe, South and Central America, and the Middle East and Africa (MEA). The Middle East and Africa region is the key contributor in the global oil storage market and is expected to expand at a strong CAGR of 7.91% from 2016 to 2024 to retain its lead throughout the forecast period. Saudi Arabia, Iran, UAE, Oman, Qatar, and Nigeria are some of the prominent countries in the MEA oil storage market. This region is primarily driven by the surging oil production and declining oil prices. The North America oil storage market was next in line, accounting for a share of around 23.90% in 2015. The market in this region is fueled by the rising need for additional oil storage space. The demand for increased storage capacity is the result of the shale revolution. The revolution has stimulated growth in crude oil production and is the primary reason for crude oil oversupply in North America. 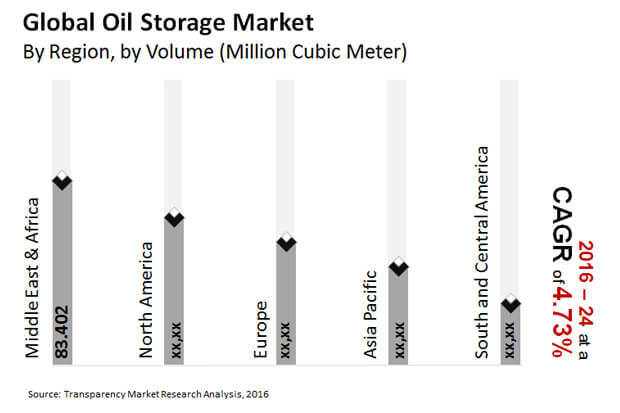 High investment in the expansion of storage capacity is expected to boost the oil storage market in North America during the forecast period. Asia Pacific is also a key market for oil storage and the region is projected to expand at the fastest CAGR of 8.22% from 2016 to 2024. China, South Korea, Japan, and Singapore are the leading countries in terms of volume of oil storage in this region, fueled by the rise in investments in petroleum reserves. Based on type of reserve, the oil storage market is bifurcated into commercial petroleum reserve and strategic petroleum reserve. Accounting for a massive 79.21% share in 2015, strategic petroleum reserves were the key contributors toward the overall oil storage market. However, strategic petroleum reserves are growing at a gradual pace as the expansion of these reserves require large investments from governments. Commercial petroleum reserves, on the other hand, are expected to expand at a CAGR of 7.80% from 2016 to 2024. Large deviations in oil prices have led to the growth in storage capacity expansion, driving the demand for commercial petroleum reserves. Oil storage in commercial petroleum reserves influences the prices and planning of future oil storage and this helps in formulating expansion strategies for oil storage facilities. The prominent vendors in the global oil storage market include Horizon Terminals Ltd., Sunoco Logistics Partners L.P., Magellan Midstream Partners L.P., CLH Group, CIM-CCMP Group, Vitol Tank Terminals International B.V., Oiltanking GmbH, NuStar Energy L.P., Ghazanfar Group, Royal Vopak N.V., Buckeye Partners L.P., Kinder Morgan Inc., and International-Matex Tank Terminals, Inc.
Petroleum products are produced through rigorous operations such as identification of oil reserve, exploration, production, refining or processing operations, storage and logistics of supplying petroleum products to end-users. Oil production has been increasing steadily across the globe. The supply of oil in the market has surpassed the demand and consumption of oil. This has created a favorable market for oil storage which can be consumed in future. Oil storage products primarily consist of crude oil, gasoline, aviation fuel, and middle distillates (e.g. diesel, naphtha, kerosene, fuel oil, petrol, marine bunker fuels, and gas oil). Middle East and Africa dominates the global market for oil storage. This report by Transparency Market Research analyzes, estimates, and forecasts demand for oil storage on the global and regional level for an eight-year period from 2016 to 2024 in terms of volume. The study also provides information on drivers, opportunities and restraints along with their impact on the overall market during the forecast period. The report segments the market based on type of storage, product type, reserves type, and geography and provides estimates and forecast of the oil storage market for each segment.